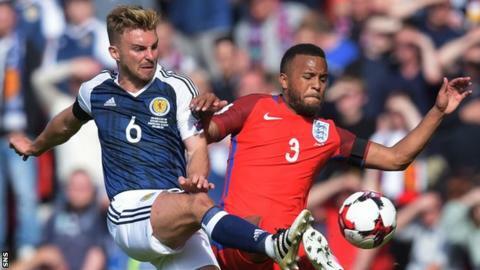 West Brom midfielder James Morrison has been called up to Scotland's squad after two players withdrew. Steven Fletcher and Tom Cairney will miss the World Cup qualifying double-header with Lithuania and Malta. Striker Fletcher was substituted during Sheffield Wednesday's draw with Burton and Fulham midfielder Cairney has been struggling with a knee injury. And experienced midfielder Darren Fletcher is a possible fitness doubt for Gordon Strachan's side. Liverpool defender Andrew Robertson will join the squad on Tuesday having recently become a father. Scotland sit fourth in Group F, four points behind second-placed Slovakia as they look to earn at least a play-off spot for the World Cup in Russia next summer. Morrison, 31, has won 43 caps and started the Scots' most recent match, June's 2-2 draw with England, but came off injured. "I phoned James last night just to chat about football and how he had got on," Strachan said on Monday. "He said he was surprised to have played two games [for West Brom] so far as he didn't expect to be that far forward. "When we discussed it two weeks ago I said to him, 'I better leave you out for this one because you've not had many games'. "But he's had these two games and is now feeling really good about himself. When we had our conversation I asked if he fancied joining us and he said, 'Yes, certainly'. "So he's here now and that's good."